Today we have chosen a verse that reminds us of God’s rest. The burdens we carry are heavy. No doubt. Who amongst us doesn’t feel the weight of what you’re walking through? If, by some miracle, your personal life isn’t burdensome right now, you need only look at the condition of the world around us or the headline news. It’s enough to make the most godly saint weary. This verse in chapter 11 of Matthew is conditional. There, I said it. It is dependent. Doesn’t it seem like there’s always a catch? Just when it seems like there might be a break in our dark clouds, it’s conditional. It’s always something we have to do to get it. 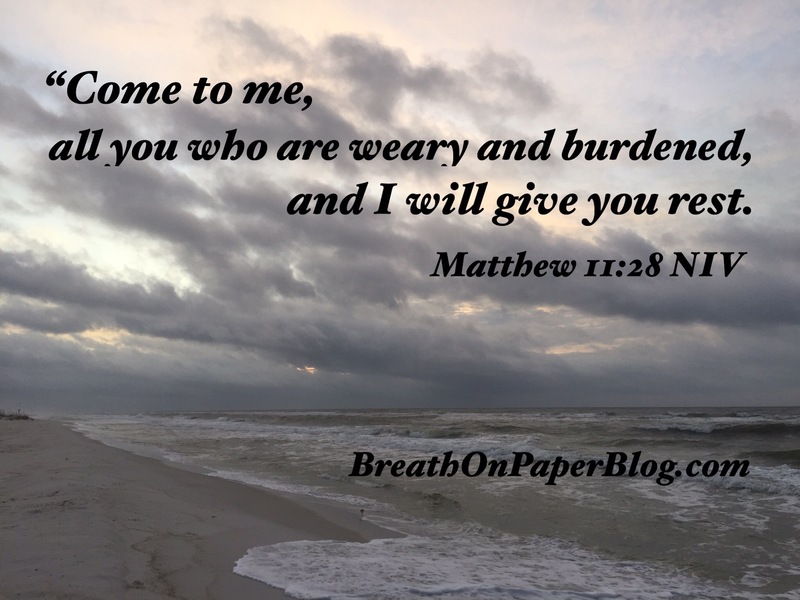 God says, “Come to me.” The Truth is, He is there with you, why not come to Him, with all your burdens and weariness. In reality who else could carry all the weight we try to manage on our own? “I will give you Rest.” Give. If I were to give you a beautifully wrapped gift with one thousand dollars tucked away in it, and you didn’t take it, you couldn’t enjoy the bounty the cash would afford you. The same is true with the Gift of Rest. It’s there waiting. Accept it! Enjoy the benefits of God’s Rest. Just like we know the sun is on the other side of these storm clouds, God waits patiently for you to give Him your dark clouds so He can bring breakthrough. He longs to shine though for you. Choose to ‘Come to God’ and accept His ‘Gift of Rest’. It’s a promise for YOU! And it’s for today. Because…you are all that God says that you are. You are enough.